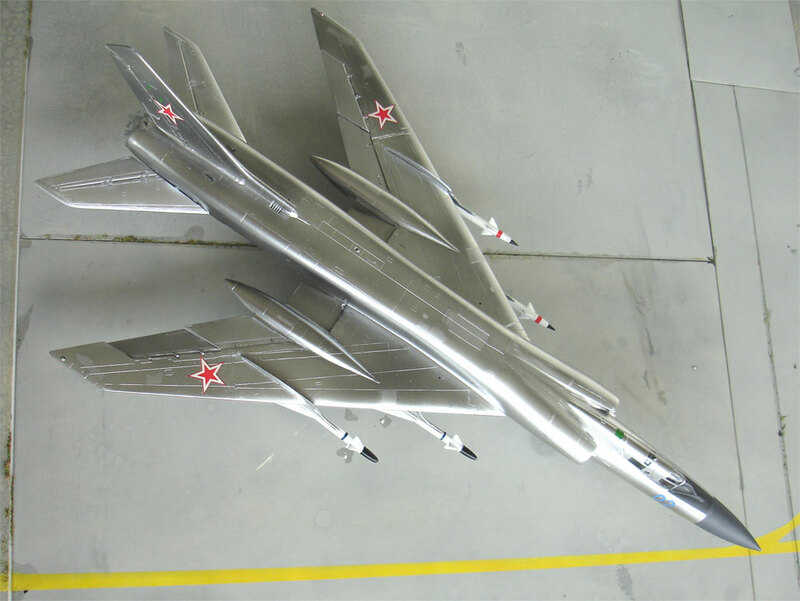 AModel from the Ukraine has a 1/72 scale injection moulded model of the Tu-128 Fiddler (kit no. 72100), which was obtained March 2004. 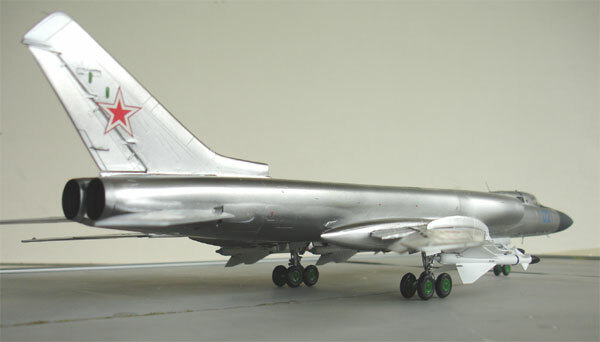 The kit is the first kit of this Tupolev type I have seen and is a very nice subject in any Soviet plane collection. In the "old days", you could remember vague black and white pictures of this interceptor with NATO code name Fiddler. 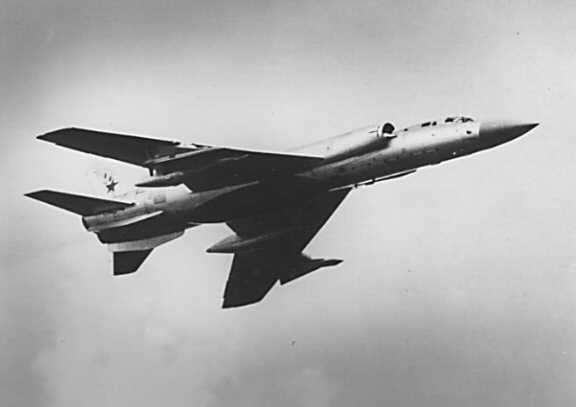 The Tupolev Tu-128 was a long range "Cold War" interceptor, intended to defend the Soviet Union by intercepting any strategic bomber of the period like the B-52. It first flew in 1961 and over 200 machines were build. 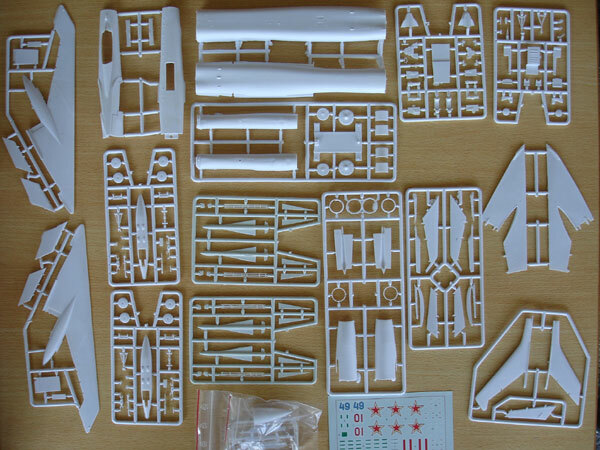 The Amodel kit has many sets with sprues and the long fuselage has separate nose and rear section; I guess because of the limited size of Amodel's moulding machine. 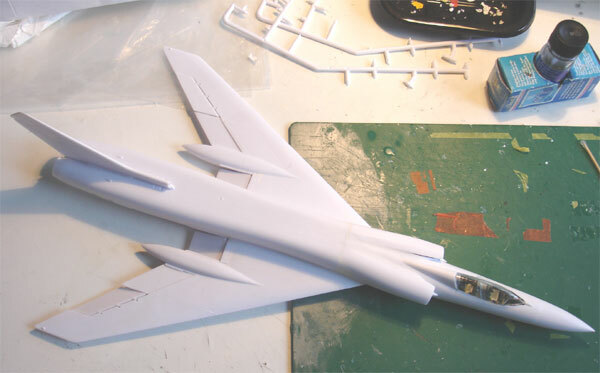 There are about 110 parts for the aircraft and 35 for the missiles. The kit parts are pretty OK but is limited run so you need to clean up the parts first which is best done with some sandpaper. The detail is also OK, with a lot of delicate parts in eg. the undercarriage and the separate flaps. Panellines are finely engraved. modelling the model can be done relatively straight forward by following the modelling steps. The instructions are fine and Humbrol colours are indicated. I decided to build this kit straight "from the box" and not bother too much on getting it perfect. The cockpit may be build as provided and you won't see that many detail with canopy closed. I painted the interior a mix of the typical black and greys by simply following the kit instructions. I added some seat straps. 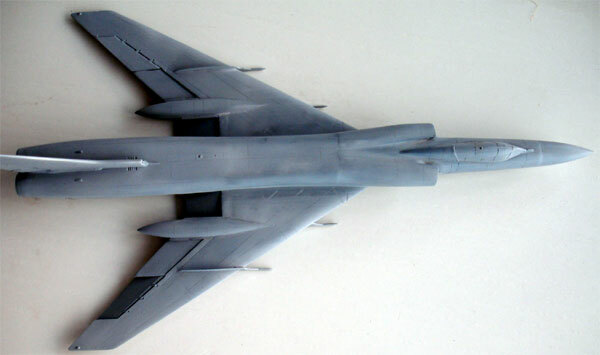 The nosegear bay was made but the leg was set onto the model later on. The nose part # 110 needs some extra attention to get a good fit. Use putty and sand as needed to get a smooth result. I did not bother to drill out the landing light holes, they are a bit too large. The exhaust pipes are not accurate but I did use them after some cleaning up; they are a bit tidious affair. I managed to get a reasonable result. Assemble but leave the flaps for later. Add the wheel pods # 46 at this stage, otherwise you get a poor fit. Now you can handle them better and get a better fit by sanding and filling. 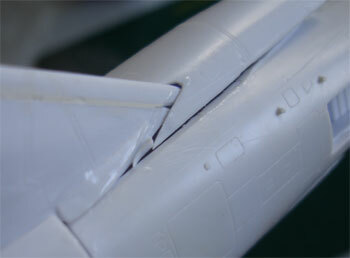 This work on the undercarriage legs asks your patience, but it can be done. The parts are pretty well detailed. 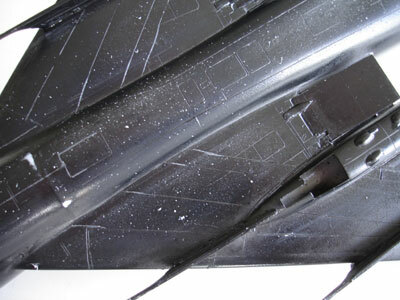 Don't bother with the inboard inlet tunnels parts # 18+19 as you will not see anything inside! Also, don't bother about the engine compressor parts. 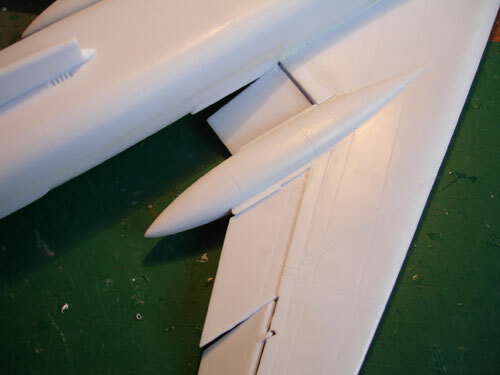 Remove any plastic at the rear of part #2 to get a perfect alignment between the upper and lower fuselage sections. 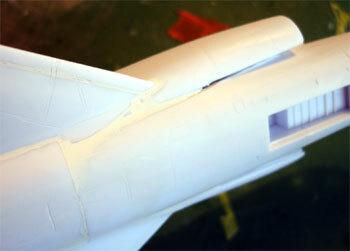 You will find that some filling and sanding is necessary between the nose and rear section of the fuselage. 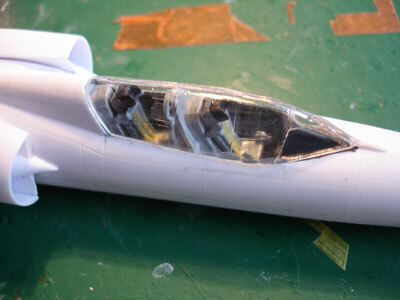 Next, concentrate on getting a good fit in the intakes parts #29-33. It can be done with some care. Putty and sanding is needed in this area. 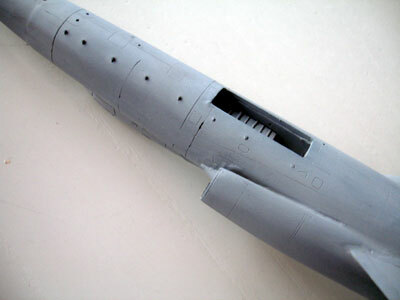 Assemble the tail area as shown, but sand the parts straight as they have some irregularities. I think also that Amodel mixed up the right- and left stabilizers. I removed the small stub at the front of the stabilizers. Leave for later.... 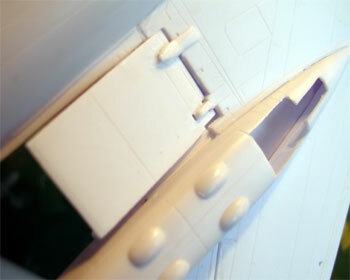 I did not yet fit the undercarriages and doors until a first metallic paint was on the model. Pylons need some white glue to fill the gaps , but you will need some work here to get a tight fit. Same applies to the wing fences. 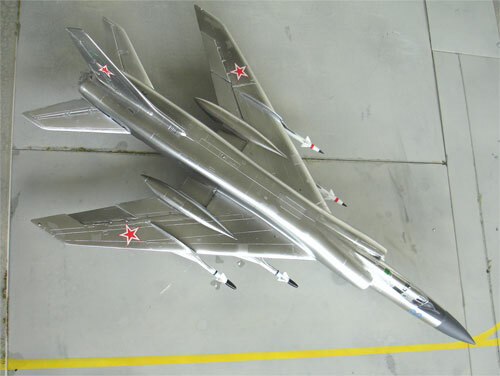 The missiles are best replaced; I got other AA-5 missiles from a 1/72 Condor Mig-25 kit. The canopy was fitted and carefully aligned. Fill and gaps now as the canopy needs large areas to be covered also with the final finish. 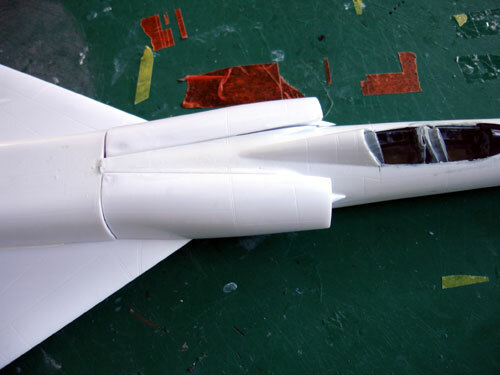 Now, the flaps were also added to the wings. The flaps also need some sanding and I simply installed them in the up position. 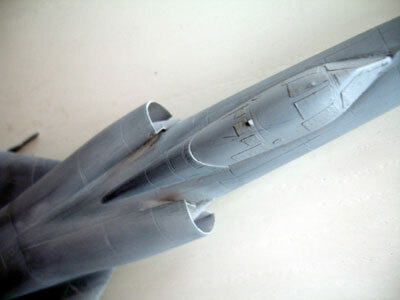 The model was not ready to get a first coat of light grey Humbrol 64 with the airbrush to check for any flaws. Corrections with small amounts and putty and some sanding was done as needed. 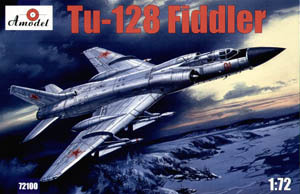 Fiddlers flew in a rather dull scheme with an overall aluminium finish, a number code and red stars. 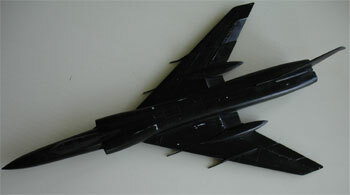 The model was finished using Alcad II Aluminum and in some areas the Dark Aluminum. It is essential to have a very smooth gloss black surface. 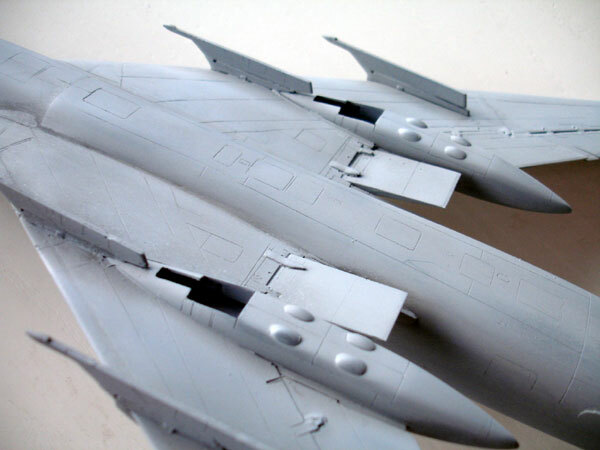 Therefor, after masking the transparant canopy parts, the model was given an overall coat of black, then a couple of coats of Johnson Future (essential as it has is acrylic based). The ALCLAD II gave no further problems and the surface with polished with a cloath. The red stars were used as provided although the white bounderies are a bit wide as did not have any good stars available in the correct size. Weathering was kept to a minimum with some panels getting a painted on different shade of aluminium with Humbrol 11 and some panels even green! After decals were dried, the overall model got a coat of again Future to protect the finish. The tyres got a caot of matt varnish.